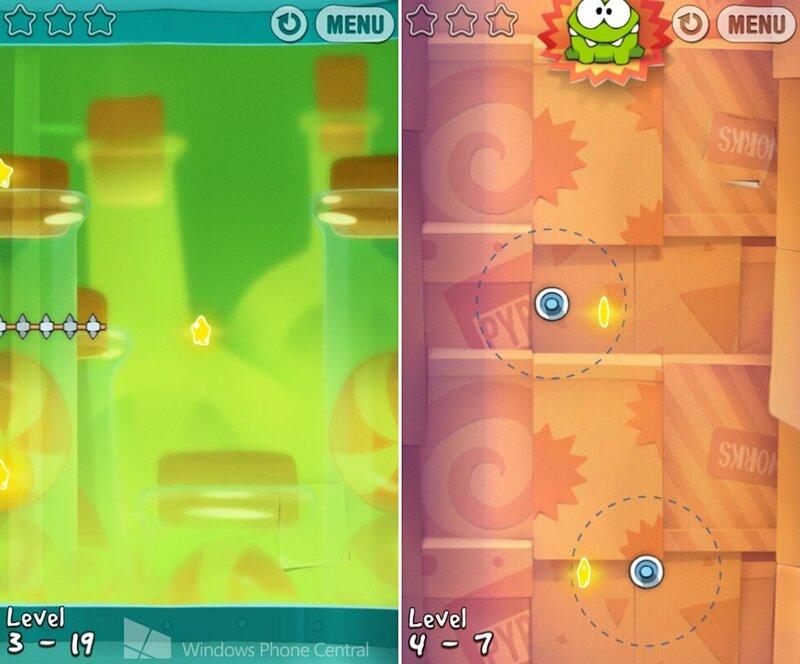 The original Cut the Rope is one of the most popular Xbox Windows Phone games, and for good reason. The gameplay is simple and easy to learn, while perfecting levels provides a fair challenge. It packs a ton of levels and it only costs a buck – the perfect price point for mass market acceptance. And of course, it stars the lovable Om Nom, an endearing creature who has his own series of animated shorts on YouTube and physical merchandise like toys and games. 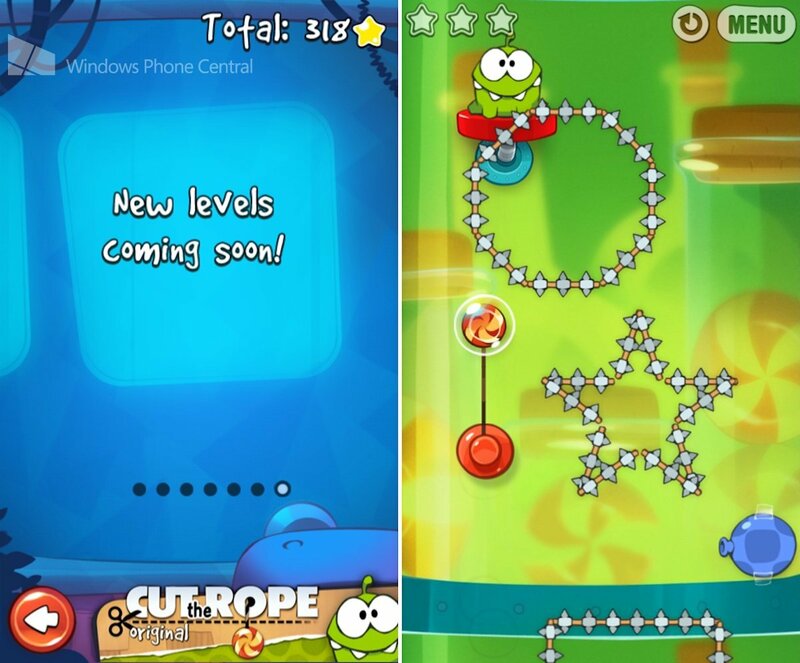 Now Cut the Rope is back, but not as the update with more levels promised within the game. 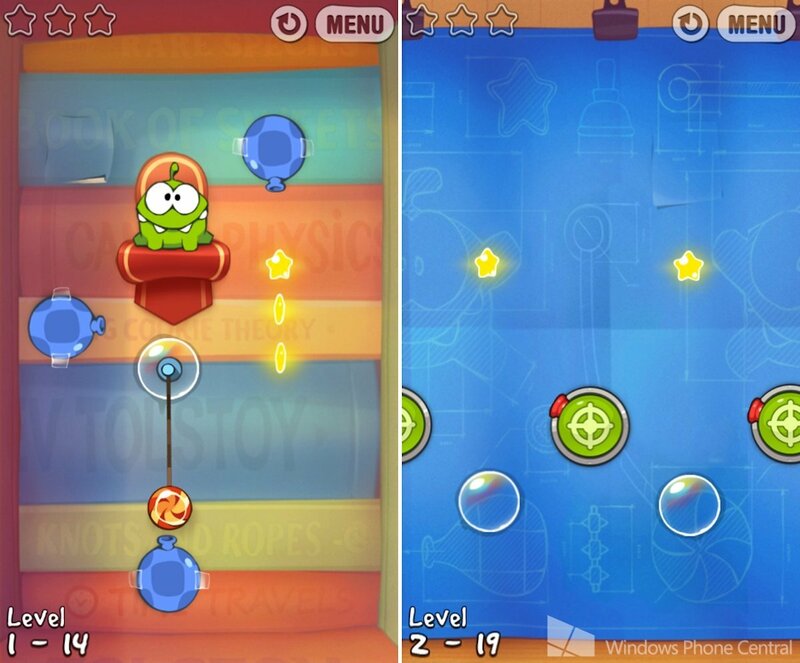 Instead, ZeptoLabs has just released a sequel, Cut the Rope: Experiments. This one packs 150 more levels of gameplay in exactly the same style as the first, plus a few minor improvements. Now that its price has dropped to a buck, is Experiments a necessary buy for fans of the original? Read on to find out! Experiments begins and ends with a charming little story, told through brief animated videos. At the outset, we find the family who took care of Om Nom in the first game in the process of moving to a new residence. The car hits a bump and Om Nom’s crate falls out, much like the toys always seem to do in Disney’s Toy Story movies. Talk about neglect! Soon an elderly professor finds Om Nom and takes him back to the lab for experimentation. Don’t worry, the experiments consist of ways to feed Om Nom candy using gadgets, not the deadlier variety seen in Chickens Can’t Fly. The professor provides brief voice samples at the beginning and end of each level as well as making an on-screen appearance in the very first level, giving Experiments an extra dose of personality. As I said, Experiments’ core gameplay is identical to Cut the Rope’s. Let’s run down the basics for those few gamers who haven’t played the original. The goal of each level is simply to feed Om Nom a single piece of candy. On top of that, you’ll also want to use the candy to collect some or all of the level’s three stars – reaching star milestones unlocks new batches of levels. The main gameplay mechanic involves cutting the rope that holds the candy by swiping it with your finger. Sometimes the candy is attached to multiple ropes, in which case you can cut a single one or slice them simultaneously using two fingers. The trick is to get the candy swinging in the right direction by releasing the ropes’ tension. Also, if any of the ropes are pulled tightly enough to appear red, cutting that rope will launch the candy in the opposite direction at high speed. Experiments launches with six sets (or boxes) of 25 levels, for a total of 150 levels. Each set introduces at least one new tool or mechanic. These differentiate Experiments from the original more than anything else because they give every batch of levels a different flavor than what came before. Drum: These start showing up in the first box. Candy bounces off of drums like a trampoline. Rope shooter: Beginning with the second box you’ll come across these manually activated gadgets. Tap a rope shooter and a line attaches to the candy, regardless of the candy’s position. Each shooter only gets a single shot. Suction cups: First encountered in the third box, one or more suction cups will be attached to the candy at the start of the level. Tap a cup to make it unstick from the wall; a second tap reattaches it. Suction cups can be tricky to use! Rockets: The fourth box introduces rockets. When candy falls on a rocket, it sticks to it and then the rocket flies forward. Some rockets are attached to wheels; tap the wheel to turn and aim the rocket. Flying rockets attached to rope simply spin around in a circle until you cut the rope and let the rocket go. Water: The fifth box levels are filled with water, either of the stationary or draining variety. Candy floats the top of water. If the water drains in a level, you generally have to finish it quickly. Snails: These creatures sometimes show up in water levels. When candy touches a snail, the snail sticks and makes the candy sink. Tap the snail to release the candy and make it float. Robot arms: The sixth box has these cool arms that you rotate by pressing the button at the base of the arm. Some arms have rotatable joints that work the same way. If candy falls into an arm’s hand, the hand catches it. You can then rotate the arm to the desired position and tap the hand to let that tasty treat go. Let's hope they really do come soon! 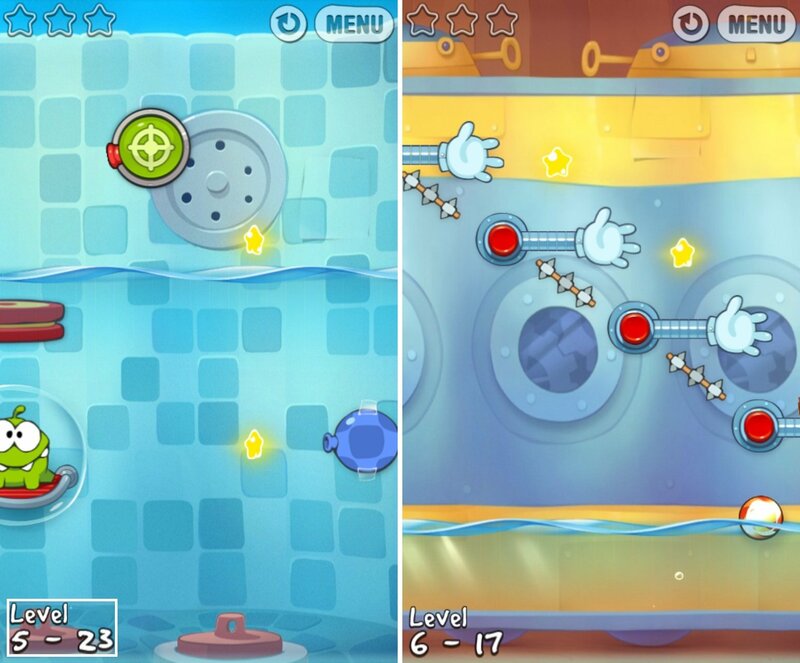 Like the first game, the Windows Phone version of Experiments is incomplete compared to other platforms. iOS and Android have a seventh level box called Ant Hill. Our version promises that more levels are coming soon, but since ZeptoLabs has yet to update the first game after six months, I wouldn’t count on Experiments actually getting updated. Another complaint: the loading times between levels and the menu are longer than they should be, even when running from a Windows Phone 8 device. It’s too bad the game wasn’t developed natively for Windows Phone 8 since the entire game could fit within WP8’s larger allotment of RAM. On the happy side, the first game’s single background tune has been replaced with two new tunes in Experiments: one for the first four boxes and another for the last two boxes. Coupled with the Professor’s voice samples, Experiments delights the ears much more than its predecessor. Just like Cut the Rope, Experiments provides a quick and easy 200 GamerScore. Players can get all of the Achievements in as little as 2-3 hours. You only need to collect 300 out of 450 stars in order to unlock all the level-based Achievements; gotta love when games don’t make us perfect every level. The rest of the Achievements involve activating the various props X number of times, cutting 600 ropes, etc. One Achievement requires players to find the pictures hidden within the backgrounds of certain levels. Just tap the irregular wallpaper patches within those levels to get the pictures. Because we love you guys, we've revealed the picture locations in this review's screenshots. Or check out Arsenic17’s Achievement Guide for text descriptions and more Achievement help (love not guaranteed). 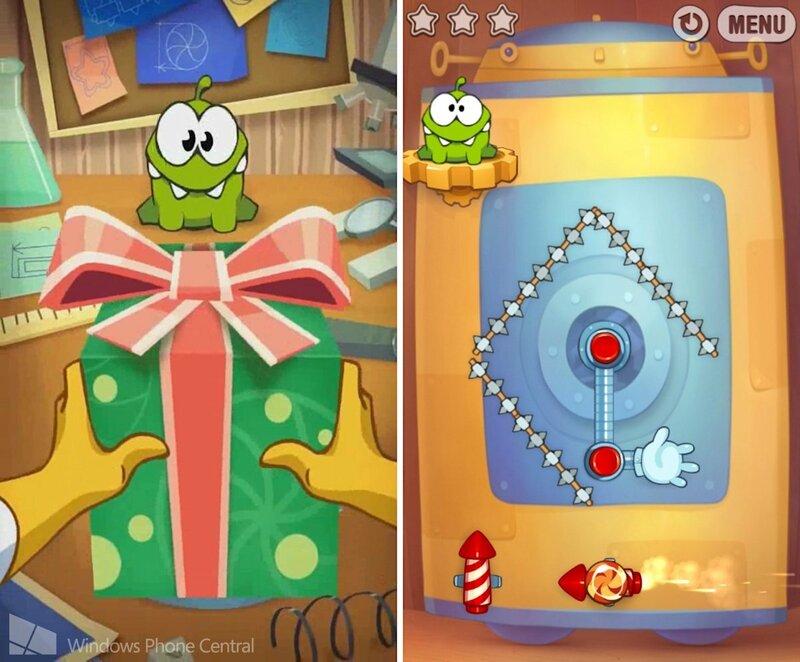 Cut the Rope: Experiments doesn’t change the series gameplay up as much as Cut the Rope: Time Travel (which we hope comes to Windows Phone soon), yet the new tools, story, and other minor improvements still make for a better game than the first. This sequel may not pack as many levels as plain old Cut the Rope, but I don’t have the patience to complete 300 levels anyway. Seeing as how Cut the Rope: Experiments sells for just a dollar, fans of the original and Achievement hunters should grab it up without delay. Om Nom isn’t going to feed himself! 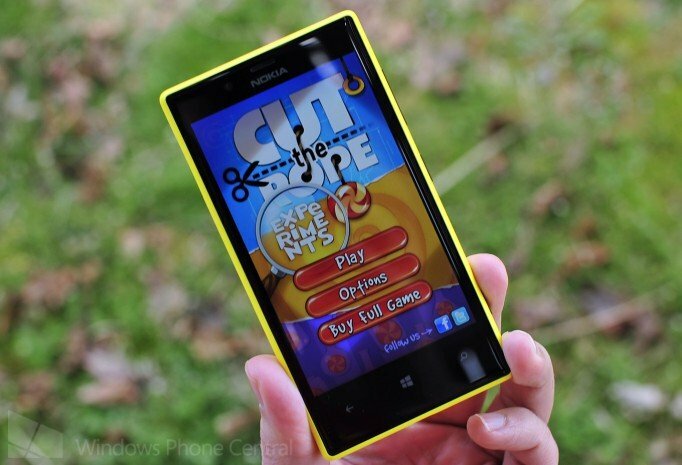 Cut the Rope: Experiments costs 99 cents and is a 29 MB download. It runs great on Windows Phone 7 and 8. Grab it here from the Windows Phone Store.